SEEING STARS: Boston was bustling with celebs this weekend, and we’ve got the scoop on a share of sightings. We’re told that: Actor William Fichtner — who’s best known for playing Sheriff Tom Underlay on “Invasion” and Alexander Mahone on “Prison Break,” as well as his work in flicks like “The Dark Knight,” “Mr. and Mrs. Smith,” “Crash” and “Armageddon” — was spotted dining at Scampo in the Liberty Hotel; Patriots wide receiver Julian Edelman was seen at Sonsie on Newbury Street on Saturday night, where he was seated with five friends; and “Scandal” star Kerry Washington was apparently all about eating her way through the North End, popping into Trattoria il Panino for lunch and having dinner with her family in a private room at Ristorante Lucia on Sunday. Word is, Washington and her fam spent that morning having an exclusive, behind-the-scenes tour of the New England Aquarium. We hear that the VIP group enjoyed up-close encounters with the facility’s giant Pacific octopus and a huddle of harbor seals, as well as an array of small sharks and rays within its huge touch tank. A SYMPHONY OF CASH: The Boston Pops on Nantucket concert hit Jetties Beach this weekend, wowing thousands on the island with the sweet sound of music and a special announcement. At the event, Bruce Percelay of Nantucket Magazine and The Mount Vernon Co. joined Nantucket Cottage Hospital President Dr. Margot Hartmann to celebrate raising $114 million to construct a new hospital building in early 2019. 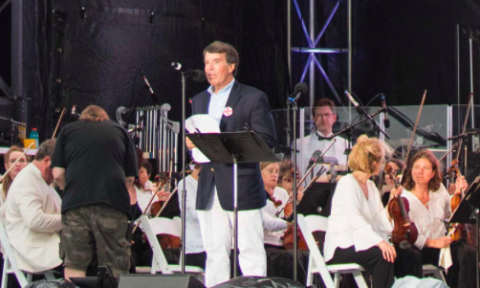 Besides the milestone news, the evening, which serves as a regular fundraiser for the medical center’s operating fund, also featured entertainment from conductor Keith Lockhart and the Pops, a performance from The Beatles tribute band RAIN and a fireworks display. Among the notable members of the audience: Dr. Peter Slavin and Ed Lawrence of Massachusetts General Hospital; former Bank of America Chairman Chad Gifford and his wife, Anne; Google Chairman Eric Schmidt and his wife, philanthropist Wendy Schmidt; Fidelity CEO Abigail Johnson and husband, Chris McKown; Putnam Chairman Bob Reynolds and his wife, Laura; Nantucket Cottage Hospital board member Elisabeth Percelay; Vanity Fair writer Maureen Orth; real estate developer Stephen Karp and his wife, Jill, who both sponsored the show; and Joyce Kulhawik, who served as emcee. WRITERS, UNITE: Pulitzer Prize winner Tony Kushner, playwright Ryan Landry and author poet Nick Flynn served as guest readers during a revival of Robert Pinsky’s Favorite Poem Project on Friday night at the Fine Arts Work Center in Provincetown. The literary get-together, which made its return to the center this weekend as part of its 50th anniversary, was originally launched in 1998 during Pinsky’s tenure as the Poet Laureate Consultant in Poetry to the Library of Congress.